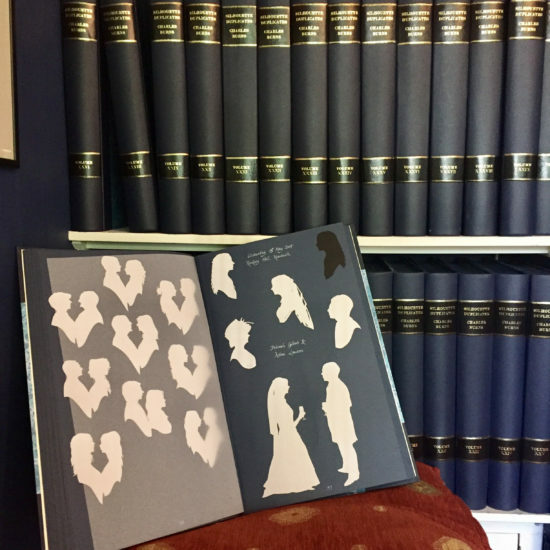 If you have ever seen my film, or heard me speak, you will know the story of how I taught myself to cut silhouettes by studying the duplicate albums of Hubert Leslie. Leslie was a silhouettist who worked on Brighton’s West Pier in the 1920s & 30s. He bequeathed an extraordinary collection of over 20,000 silhouettes, pasted into his duplicate albums, to the National Portrait Gallery. Whenever he cut a silhouette, Leslie would cut through a double layer of paper. 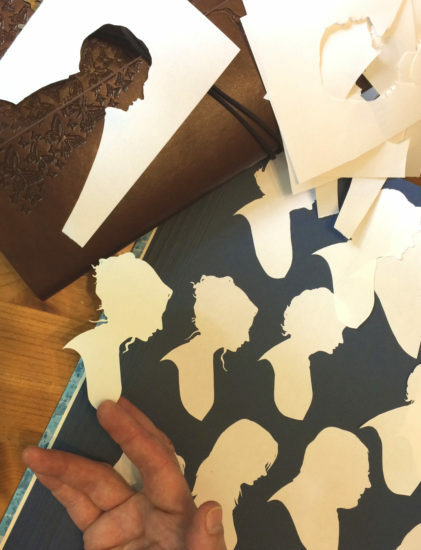 He thus created two copies of each silhouette: one for the client and one for his duplicate albums. All the silhouettes are numbered, and many are also signed by the sitter. He was known as the best silhouettist of his generation. Many celebrities of the day visited the West Pier and posed for him. Their silhouettes remain in these albums, little shadows from the past. As soon as I saw these albums I realised this was a tradition worth continuing. So, for the last twenty years, I have been keeping the white top copies of every silhouette and pasting them into albums. Other silhouette artists think I’m slightly mad! What began as a harmless eccentricity has grown into a monumental collection. 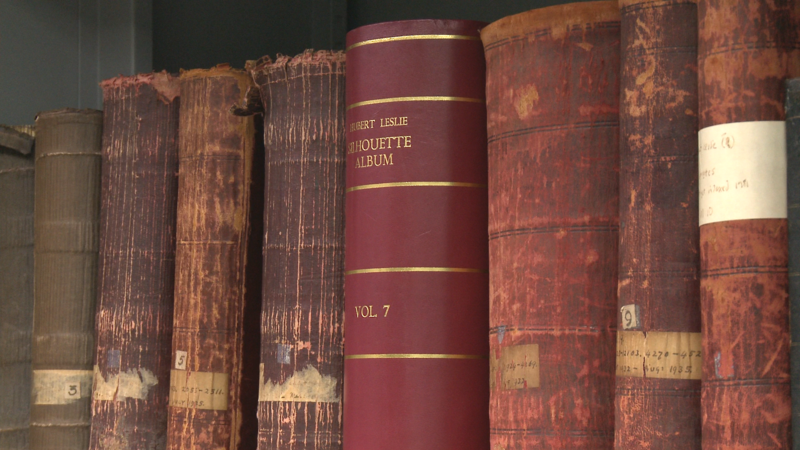 To date there are 60 albums, each containing around 3,000 silhouettes. My output has far exceeded that of Hubert Leslie! Essentially, however, the collection is a homage to the man I regard as my teacher, even though I never met him. Of course, there are commercial applications: by scanning the duplicate silhouettes I can create prints of all the silhouettes cut at a particular event. This is especially popular at weddings. I can also produce, on request, copies of treasured silhouettes which are lost or damaged. On one occasion I was able to prove that an expensive antique silhouette — being offered for sale on eBay — was actually one of mine. I located the duplicate in my albums! Can a silhouette survive a fire? However, the true value of the collection was brought home to me recently, after I received a request to cut a pair of silhouettes. The client explained that she had booked me to attend her own wedding in 2005. 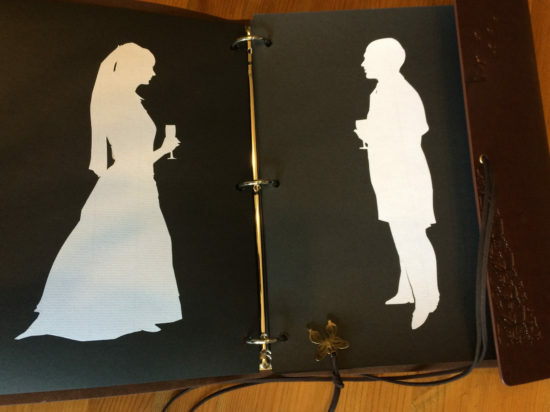 She now wanted new silhouettes of her husband and herself, as a birthday present for her husband. At their wedding I had cut two copies of every guest, one for the guest and one for the couple. I had stuck the second set of silhouettes into a book, as I worked, with each guest writing their name underneath. Naturally, we started chatting, and I asked her how things were going. It turned out that they weren’t going so well. Two years ago a building contractor had accidentally set fire to their house, while building a small extension. Luckily, nobody was hurt, but the house was burnt to the ground, They had lost everything they owned. Among their many treasured, lost possessions was, of course, the small book of silhouettes I had cut at their wedding. Two years on, although now settled in a new house, they were still struggling to rebuild their lives. I explained that I would have actually cut three copies of each silhouette, that I always keep an extra, white copy for my duplicate albums. This news had quite an effect. It gradually dawned on my client that her wedding silhouettes may not be entirely lost after all. Later, I met the couple on Skype. I cut their silhouettes for them, and also showed them Volume 22 of my duplicate albums. This volume contains the three pages of silhouettes I had found from their wedding. In the circumstances, they must really have seemed like shadows from the past. The client quickly began pointing out friends and relatives, and said that she had never expected to see these cuttings again. The upshot of the conversation was a commission to recut the entire set of silhouettes. Seeing my albums, she liked the silhouettes in white, so sent me a small leather-bound book of black pages to stick the silhouettes into. Cutting the white copies was an interesting excercise. Over the last twelve years my style has evolved (improved, I hope) to the extent that I felt like I was copying the work of another artist. 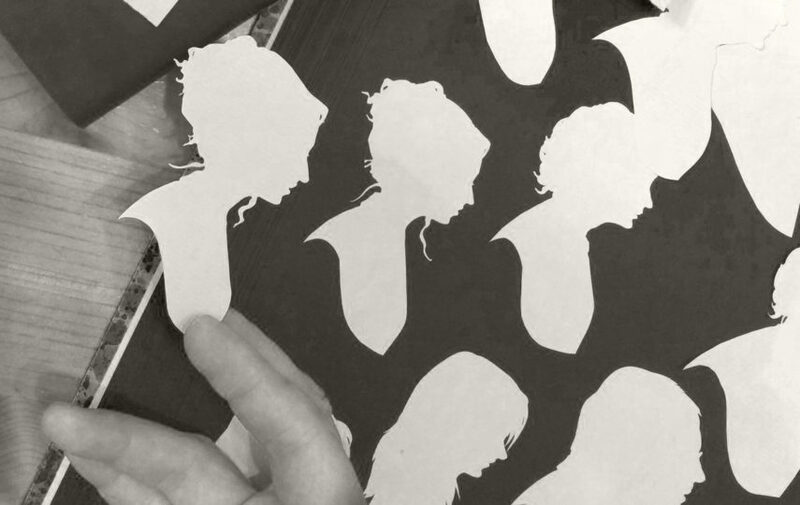 It took me back to the time I spent at the National Portrait Gallery, over twenty years ago, making copies of Hubert Leslie’s silhouettes, trying to work out how he used the scissors and turned the paper. I found I could cut some as almost exact facsimiles, in just a minute or two, while others needed a number of attempts to get them right. My hands kept wanting to add extra flourishes, as I might today. However, I kept them disciplined and remained as true to the originals as I could. Meanwhile, using photos of my albums, the client had worked out who was who. She had matched all the couples together, and worked out a page order to stick them in. So, after cutting, it was a simple matter to paste them all in the book and post them to the client. A week or so later I received an effusive and quite emotional thank-you letter, which I felt was out of all proportion to the amount of work actually involved. Of course, nobody likes to think about what it must be like to loose everything in a fire, but I imagine any small, inconsequential item — rescued from the ashes — must suddenly seem so much more important. 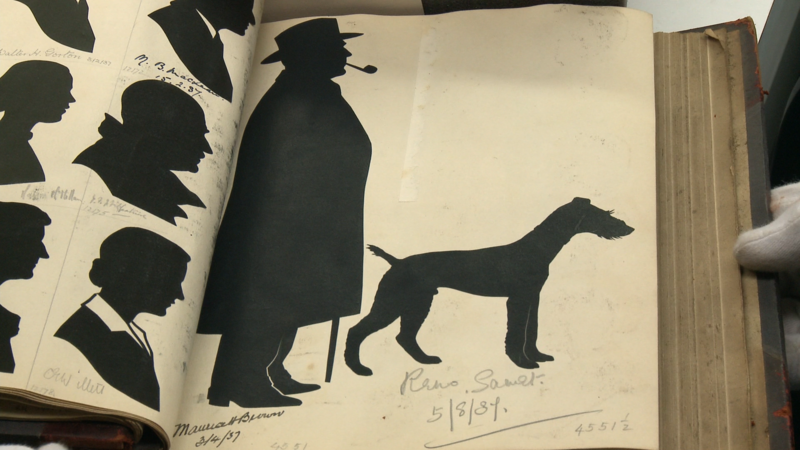 My habit of keeping a record of my work, inherited from Hubert Leslie, had enabled me to rescue these few silhouettes from the ashes. For me, it was an interesting project, and a humbling lesson in the value people can attach to my silhouettes after I cut them. Charles, I think you are amazing..and extremely good….written down in history. How moving. I have a sister who lost a lot of personal possession s in a fire when she was moving and her stuff was in storage and she would have been so grateful if she’d have been able to have had her wedding pictures replicated. I love your work and have a silhouette from an event I went to when I lived in Bix. Great ending to the story, like a Phoenix rising from the ashes, by a Reading based artist too. All power to your scalpel. What a legacy to leave the world, Charles. Just make sure that you have good fire protection for your albums! What an extraordinary tale, Charles, although not entirely unexpected from such an extraordinary artist as yourself. I always enjoy reading of your adventures – keep on roving! Absolutely brilliant Charles! You are a star. Thank you for sharing your talent and work. I read every post and admire you for developing such a special trade. You keep people, skills, history and traditions alive. A lovely story and an excellent title, one for a winter fireside. Thank you everybody for all your wonderful comments. It’s great to see this post getting such a good reaction! Thank you for your report and your information. I liked that very much. – There is hardly a silhouettist who writes as much detail about his work and of any I’ve ever heard how he has learned to cut the silhouettes. – I look forward to your next report.